As you know, I’ve been sewing miniature versions of the costumes from Andrew Lloyd Webber’s production of The Phantom of the Opera. These costumes are for Gene Marshall, a 15.5″ fashion doll. So far, I’ve finished the Hannibal ballet costume, the “Think of Me” skirt, and the “Point of No Return” dress. 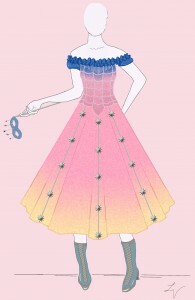 Another one I’d like to make is Christine’s pink and blue Masquerade costume. This dancing outfit consists of a snug bodice and a very fluffy ombré skirt. The original silk was airbrushed, so the dress fades from blue to pink to yellow. In some versions, the bodice is strapless and the actress wears a pair of ruffled armbands, but in other versions, the bodice is off-the-shoulder with puffed sleeves. The bodice is decorated with silver beads and small silver stars. Rows of stars also dangle down the skirt. Christine wears a silver tiara whose design varies between productions, but a crescent moon or star motif is common. 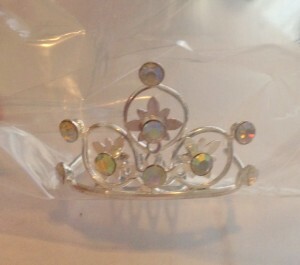 The first doll-sized tiara I purchased ended up tarnishing quite badly after a few months, but I found another that’s even better. I will paint it with clear nail polish to try and prevent tarnishing. Initially, I found a pair of white and blue Victorian doll boots that were vaguely similar to the silver and aqua boots worn with this costume. 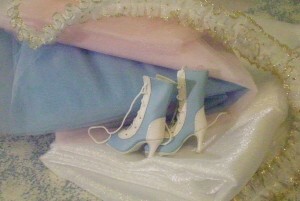 However, I recently learned that these same doll boots also come in silver, which would be so much more accurate! I’m trying to acquire a pair, now. I’ve had trouble finding suitable stars to cascade down the skirt. The closest I’ve found is Swarovski crystal flat-back stars, but they’re quite small (5mm), so I’m not sure how good they’ll look on this doll. As for Christine’s mask, I plan to make one out of papier mâché. For the costume, I’ve purchased several yards of pink and blue tulle, along with a white shimmer organza that I will dye with fabric markers to get an ombré effect for the bodice. I also found a gold-edged ruffle trim that should work well for the bodice, provided it accepts the marker dye. Since the hem of the skirt is scalloped, I will need to buy a pair of hard-to-find scalloped pinking shears to cut the layers of tulle. This should provide a very interesting effect. This project is high on my wishlist, but since I’m still missing several key components, it will probably be a few months before I’m able to start it. This entry was posted in Sunday's Someday Projects and tagged Dolls, Phantom of the Opera, Replica, Sunday, Victorian. Bookmark the permalink.